This site is SLACKING on the plum recipes. 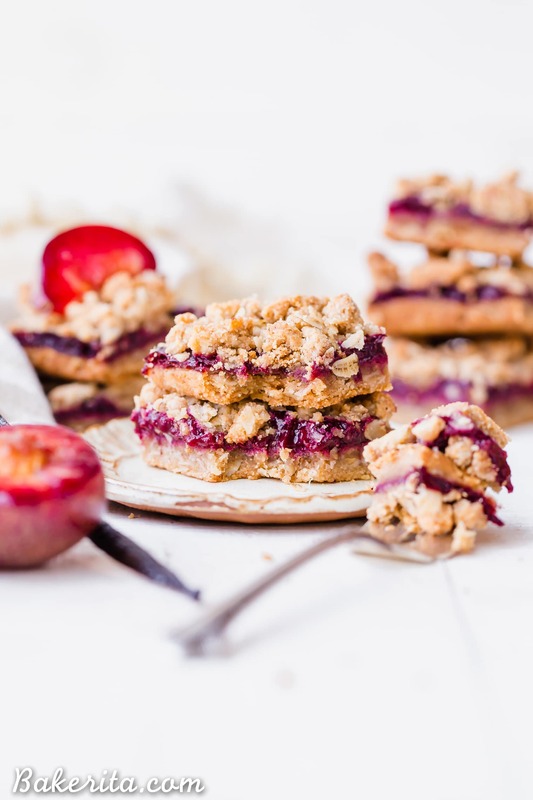 As in, they are only in one recipe – this Summer Stone Fruit Crisp. How lonely. After tasting how magically delicious the plums and pluots at the farmer’s markets here in San Diego were last week, I knew plums definitely needed to be in another Bakerita recipe, and they needed to be the star. I always bring home plums since I love them, but they usually get eaten before they make their way into a recipe. NOT THIS TIME. This time, they got tossed into a pot, cooked down with some delicious flavors, and tucked between two layers of oatmeal crumble. What a nice, comfy little bed of crumble they got ;) until they got devoured, that is. This recipe isn’t hard to make, but it does require a little bit of time in front of the stove to make that plum jam filling. In all honesty, it’s probably possible to just toss the plum chunks into the filling ingredients and layer it on the crust, but the concentrated, sweet plummy flavor of the jam is remarkably good and I think it’s worth the effort. Especially after it’s baked with the crumb topping, the sugars caramelize in a deliciously chewy, jammy filling and the flavor is so scrumptious. Since the plums are cooked down with maple syrup, vanilla bean powder, and cinnamon (and some tapioca flour to help thicken), they take on this sweet warmth from those warm flavors. It comes together in the most delightful way that will make you take bite after bite, trying to figure out what is so delicious in there. Let’s rewind to the crust/crumble though – as usual, they are one in the same, because I don’t want to have to make a separate crust and crumble when one dough can do the job just as well. I used a mix of almond flour and coconut flour, which I find gives me the best texture – the almond flour stays nice and tender while the coconut flour helps everything hold together and get nice and crunchy. Oats are in there too, for some delicious texture. It’s warmed up by some cinnamon – I just dump the cinnamon bottle over everything lately, it seems. Can’t get enough!! To bring the dough together, maple syrup, coconut oil, and almond butter come together. The result is a sweet, tender, nutty crust that pairs perfectly with the plums. 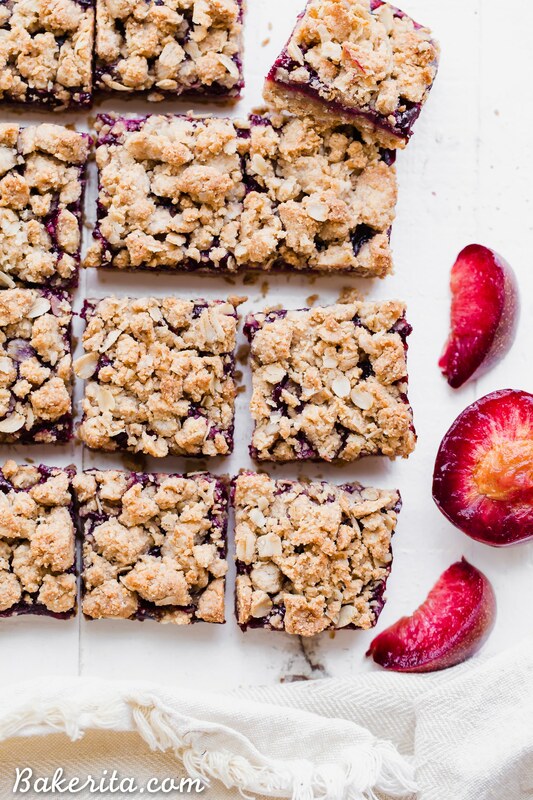 This recipe isn’t drizzled in chocolate, or dolled up in any way – they’re just simple, beautifully flavored crumb bars featuring one of the summer’s best and most plentiful ingredients: plums. I hope you’ll give them a try to appreciate just how delicious these are. Sending all of you so much love, today and each day to come. Make it a good one! 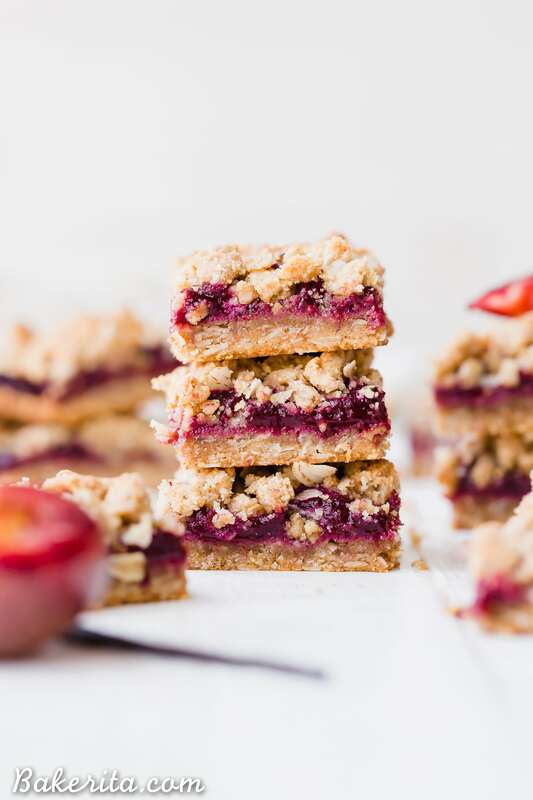 These Plum Crumble Bars have a delicious oatmeal crust and crumble topping that's filled with a simple plum jam. 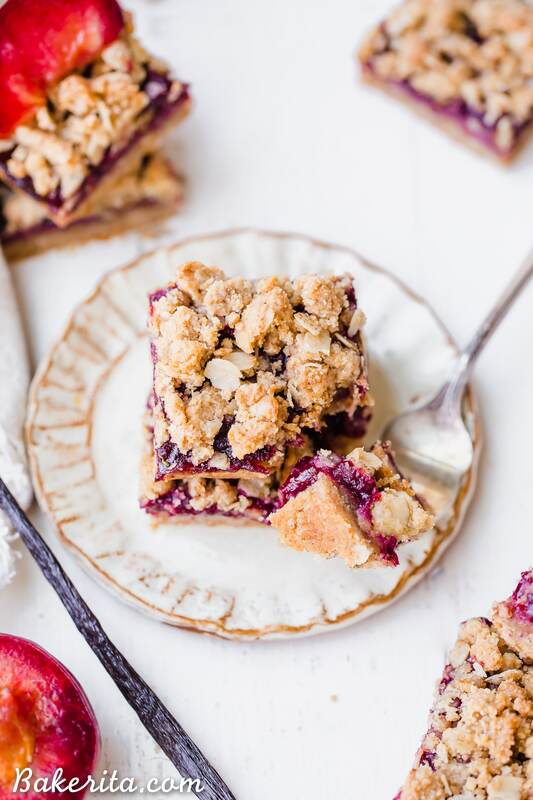 These simple bars highlight one of the summer's best stone fruits in a delicious gluten-free and vegan dessert. Preheat oven to 350°F and line an 8x8-inch square pan with parchment paper. Grease with nonstick cooking spray. In a mixing bowl, combine the almond flour, gluten-free rolled oats, coconut flour, and cinnamon; whisk to combine. Add the maple syrup, coconut oil, and almond butter. Stir until the dry ingredients are completely moistened and it sticks together but is still a little crumbly. Press 2/3 of the crust into the prepared pan, reserving the rest for the topping. Place the extra dough into the refrigerator. Bake crust for 10 minutes and then set aside to cool. While the crust bakes, add the plums to a saucepan over medium heat. Stir in the maple syrup, tapioca flour, vanilla bean powder, and cinnamon. Cook down the chopped plums for about 20 minutes or until they’re mostly broken down and reducing a little bit. Put in the blender or food processor and blitz for a few seconds to blend up the skins. Return the blended plum mixture to the saucepan and cook for 15 minutes or until it cooks down into a thick paste. When you run a wooden spoon through the center, it should take a second before it floods back into the middle. When it’s reached that thicker consistency, pour and spread evenly over the baked crust. Sprinkle the remaining crumble topping evenly over the top of the plum jam. Bake for 25 to 30 minutes, or until the topping is a nice golden brown. Let cool completely in the refrigerator before cutting into squares. Store in the refrigerator for 3-4 days or in the freezer for a few months. Sounds delish! Could you sub blueberries or even peaches for the plums or do you have other recipes for those? GIRL YES! 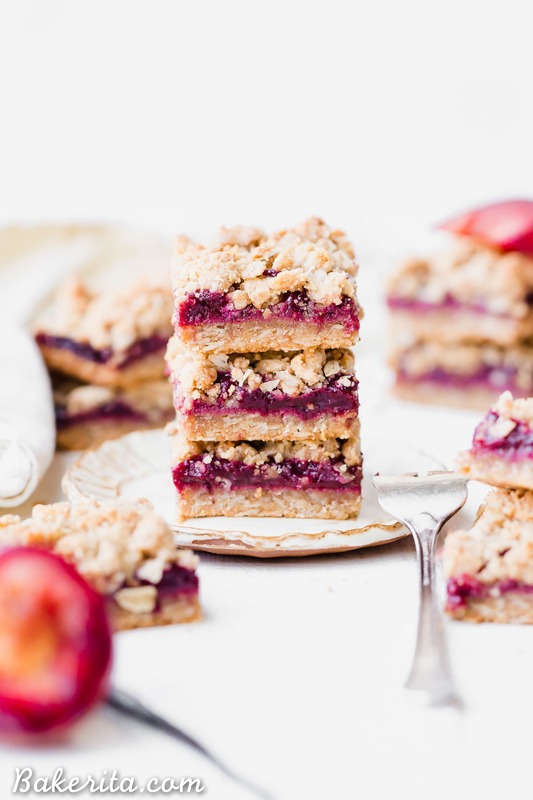 I love plums (and pluots) and these bars look like such a tasty way of enjoying the fruit. Loving how simple, healthy, and delicious they look! Agreeed! Hope you love the bars, Ashley. These are the prettiest bars, love that golden crumble!